I already have a hotels.com account, and have been collecting rewards toward a free night for a while. Is there any way to add this hotels.com reservation to my existing account or otherwise take advantage of these two nights reward credit? 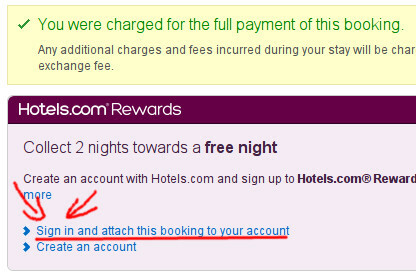 Scroll to the Hotels.com™ Rewards box and select Sign in and attach this booking to your account. If you don't see this link, your booking is already attached to your account. You should then see this message: "Success! You have successfully added this booking to your Hotels.com™ Rewards account." Not the answer you're looking for? Browse other questions tagged online-resources hotels loyalty-programs or ask your own question.